Looking for a Spectacular Sight in Hawaii? Look Up! There are times when living in the middle of the Pacific Ocean is less than convenient (expensive goods, lack of “road trips,” early-morning televised football games). But then, there are times when being isolated is a real perk — and Tuesday, March 8 is one of them! That’s when we can expect to see a “deep partial eclipse” (about 2/3 of the sun is covered) here in Hawaii, something those on the mainland won’t have the opportunity to witness. Of course, people in Micronesia and parts of Indonesia will see a total solar eclipse, but we won’t be greedy! Shanahan tells Honolulu Family Magazine that the active time of the whole movement will be from about 4:33 p.m. until 6:33 p.m. Shanahan says the peak, when you’ll see the “biggest bite” out of the sun will be around 5:37 p.m. here in Hawaii. The timings of this eclipse are same across the Hawaiian islands, although the sunset times will be different if course. For example in Kona, the eclipse starts at 4:33 p.m. and reaches it maximum coverage at 5:37 p.m., as it does in Honolulu; however, since the sun sets a little earlier in Kona than Honolulu, the eclipse will still be (barely) underway as the sun sets in Kona that night at 6:31 p.m. In Lihue, on the other hand, sunset is not till 6:42, so nearly ten minutes after the eclipse ends. Here’s the definition of a solar eclipse, according to NASA: Sometimes when the moon orbits Earth, it moves between the sun and Earth. When this happens, the moon blocks the light of the sun from reaching Earth. This causes an eclipse of the sun, or solar eclipse. During a solar eclipse, the moon casts a shadow onto Earth. From Hawaii, we won't be able to see a total solar eclipse this year. For that, you'll have to be in Micronesia or parts of Indonesia. Shanhan tells Honolulu Family Magazine that people to get to the Bishop Museum early. If you can, get to Bishop Museum right when the viewing begins at 3 p.m. 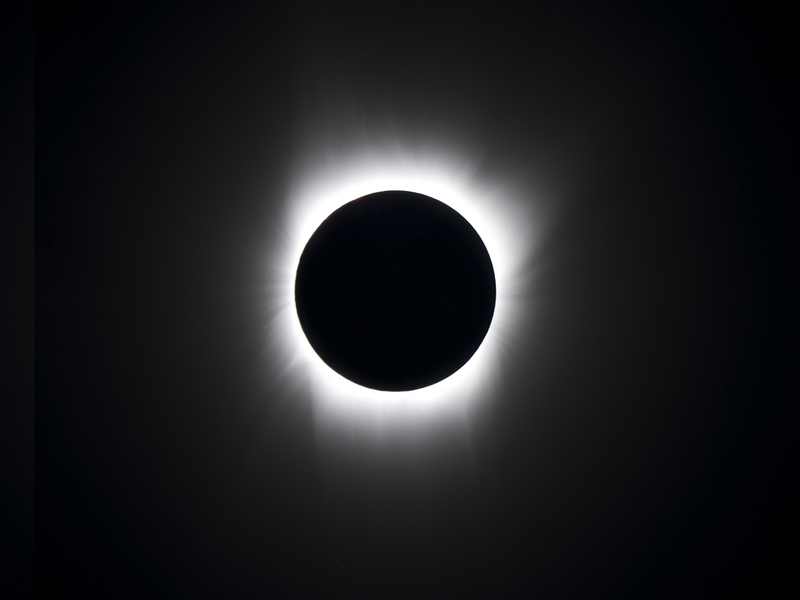 Though it is two and a half hours before the peak, you will have a chance to see the total eclipse on the museum’s live webcast from Micronesia. “That should happen around 3:35 p.m. Hawaii time. If you can’t get to Bishop Museum, or outside, that early, Shanahan still suggests arriving sooner rather than later for another reason. Clouds could block sightlines to the sun, so the longer people are there, the better the chances they’ll be able to see the eclipse through a temporary break in the clouds. For those who book an Oahu All Inclusive Vacation Package through Hawaii Aloha Travel, make sure you use your “personal day” to head to the Bishop Museum for the viewing party. You will have the option of renting a car through Hawaii Aloha Travel, so you have the freedom to plan your own eclipse excursion! Shanahan tells the magazine that he suggests picking up the special viewing glasses at Bishop Museum’s shop, priced at $2. The mylar of the glasses block out 99.9 percent of the sun’s light, versus regular sunglasses which are just designed to reduce the sun’s glare. The Hawaiian Astronomical Society will have telescopes equipped with safe filters for people at the Bishop Museum’s viewing. 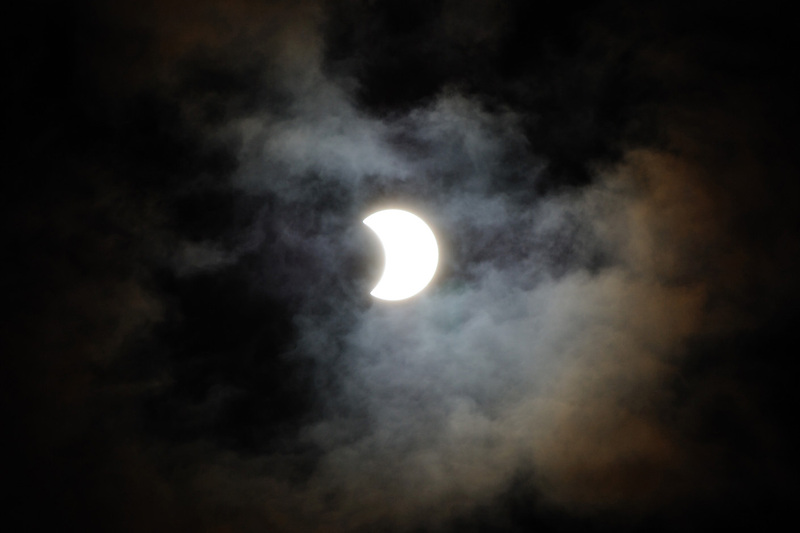 This photo was taken on May 9, 2013 from Honolulu, during another partial solar eclipse. According to Honolulu Family magazine, on Tuesday, some sections of Bishop Museum will stay open past the usual 5 p.m. closing time. Starting at 3 p.m., the Planetarium will show eclipse films every hour. The last film will start at 6 p.m. The Science Adventure Center and Hawaiian Hall will remain open until 6:30 p.m.
On the night of the eclipse, Shanahan tells the magazine that Jupiter will be in opposition, which means it will be on the opposite side of the earth from the sun. The result is what he says is essentially a “full Jupiter”, the planet will be brighter than normal and will look especially impressive through telescopes. Weather permitting, the telescopes will stay up until about 8 p.m.
Honolulu Family magazine reports that on August 21, 2017 a total solar eclipse will awe people through a narrow strip of the U.S. This will be the first to be visible on the continent since 1978. And already, Shanahan says hotels are filling up in the cities where you will be able to spot it: Salem and Corvalis in Oregon; Idaho Falls, Idaho; Nashville, Tennessee; Charleston, South Carolina. On average, he says, a single point on earth is only in the path the phenomenon once every 360 years. The next total eclipse visible from the main Hawaiian Islands will be in 2106 over the Big Island. Bishop Museum’s Solar Eclipse Viewing is Tuesday, March 8 from 3-6:30 p.m. The event is free with museum admission. General admission: $22.95 for adults, $14.95 for kids 4 to 12 years, kids under 3 are free. Kamaaina and Military admission: $14.95 for adults, $10.95 for kids 4 to 12 years, kids under 3 are free. Parking is $5. Call 847-3511 for more information or go to the Bishop Museum Planetarium website.